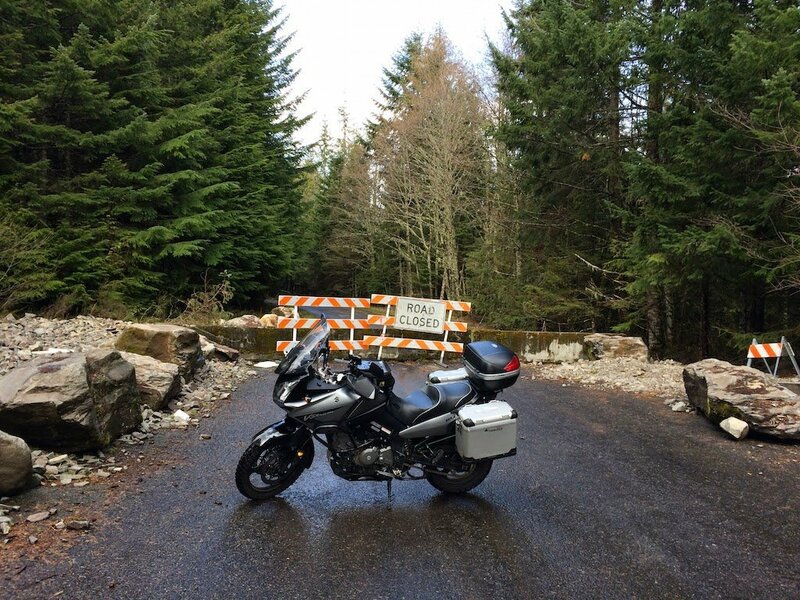 Over the weekend I took a day ride up Hillock Burn Road into the Cascade foothills. This road heads south and southeast from Highway 211, a few miles south of Estacada. A few miles up the road I saw several Clackamas County sheriff deputies and a Forest Service law enforcement officer standing at a canopy on a wide spot on the side of the road. They were handing out flyers describing the rules and laws of target shooting in the area. After telling them I was only there for a ride, the deputy I spoke with told me the road got gnarly a mile or two up the road. I thanked him for the warning, and continued onward. It had rained the night before so the gravel road was wet and there were numerous small mud puddles, but the road itself was in relatively great shape. I kept going and never came to anything that was a challenge. Hillockburn Road soon turns into NF-45. It heads south to a W-shaped pair of switchbacks before turning north again. The highest point of the road is just below 4,000 feet, and this time of year should have seen the road under a foot of snow. I went there the same time last year and had to turn back because of snow; not this year. My V-Strom with its Heidenau K-60 knobby tires performed wonderfully and I built up my confidence riding on the gravel road. It was my hope that the road was open at the north end where it quickly descends to the Clackamas River and crosses to highway 224 at the Memaloose bridge. The sheriff’s deputy didn’t say anything about the road being closed, so I remained hopeful. The previous September “36 Pit Fire” had burned both sides of the river near where the bridge crosses, and was behind the road closure. Still, since 224 was open to local traffic, I hoped they’d let me through so I could loop back to Estacada and not have to backtrack all the way to 211. Unfortunately, within a mile or two of the final descent down to 224 I came upon the road block. They had erected several concrete barriers and piled boulders on both sides. One side could have been bypassed if I walked the bike through and was very careful, but I suspected there would be landslides or other natural barriers further down the road and didn’t attempt to by past it. By the time I got home I’d ridden 120 miles, more than half of it off-road. The total route took 4 hours. It was a beautiful Spring weekend and I rode 330 miles (210 Saturday, 120 Sunday) to take advantage of the weather. Saturday was a convoluted route up the Clackamas River to Ripplebrook, down to Stayton for lunch, over to Silver Falls State Park, then back home to Sandy. Sunday was up the Clackamas yet again, this time past Ripplebrook up NF46 to where I got stopped by snow on the road several miles past Austin Hot Springs (at the junction with 4660 if you care). There were a lot of bikes out and a fair share of slow cars. Saturday I saw a funeral procession going by in the other direction, heading from Colton to Estacada, for a young fireman that died. One thing I realized over the weekend is that the Suzuki V-Strom is a truly versatile and capable bike. I’ve harped on this topic before but it’s true. The Strom doesn’t excel at any one thing — it’s not as off-road capable as a KTM Aventure nor as fast as a Yamaha R1 — but it can perform the same kind of function that both bikes provide. It’s excellence is its versatility. I am strongly considering getting a 600 cc in-line four sport bike, not because I feel the need to go faster in a straight line or around corners — I already carve up the twisties fast enough on my V-Strom, thank you very much. A 600 sport bike provides a much more immediate experience with the road. It’s more intense. But in the meantime, if you need a one-bike-does-it-all solution, the V-Strom is an outstanding choice. There are some other bikes that probably equal the Suzuki in capability and versatility, such as the Ducati Multistrada and the new Triumph 1200 Adventure, but they can’t do it for the low purchase and maintenance cost of the Suzuki. When it comes to getting your bang for the buck in a single motorcycle, never underestimate the Suzuki V-Strom. The weather in Oregon apparently didn’t get the memo about global warming. I guess that’s why they call it climate change instead. The planet is getting warmer, on average, but some areas will actually see colder and wetter weather. So far in 2011, Oregon has been acting more like southeast Alaska. It has been cold and wet and dry days have been few and far between. Saturday was dry, although not overly warm. I started at 8 AM, pulling my V-Strom out of the garage, hooking up the garden hose for the first time since last Fall, and giving my bike a much needed wash. I ride all year and washing it during the Winter months is like trying to make the bed while you’re still sleeping in it. It took a while but eventually I got all the nastiness off. After giving it a towel-dry, I pulled it back into the garage and propped it up on the center stand to re-lubricate the chain. After doing a few other chores around the house and eating brunch, I decided to get a ride in. I fueled up in Estacada, then headed up the Clackamas River highway 224 toward Ripplebrook Ranger Station. On this run I focused on practicing smooth cornering while hanging off the side for better cornering speed. It takes some getting used to and looks rather dramatic. It’s also unnecessary because I don’t corner fast enough for it to matter. However, it’s a lot of fun and that’s reason enough. Just before crossing the river at Indian Henry Campground I saw three guys identically dressed in blue and white leathers taking pictures of their three identical blue and white Yamaha sport bikes lined up in a pretty, neat row. We waved and I zoomed over the bridge and up the hill on the other size. Once at Ripplebrook, I turned around and headed back down the river to home. This run is about 65 miles round-trip and includes mostly big sweepers with a few slower curves thrown in for variety. The scenery is dramatic and there are no stop signs once you leave Estacada. There are occasionally slow cagers and every once in a while I see law enforcement, usually on summer Saturdays when the sport bikes hit the road. I’ve had some time off of work and took the opportunity to get some long day rides under my belt. My first trip was up the Clackamas river road to Ripplebrook ranger station. Not wanting to turn back, I kept going up toward Lake Harriett. My intention was to keep riding toward Timothy Lake until snow or road conditions forced me to turn back. Unfortunately they had the road gated closed about a mile past Harriet and I had to turn around and head back. I veered off onto the gravel road to Lake Harriet and rode past a half dozen die-hard fishermen trying to catch brown trout at Harriet. Several looked at me funny but nodded in approval anyway as I rode past. Two days later I took a jaunt south toward Stayton. I stopped at the Silver Creek Coffee House in Silverton for a mocha and chatted with Greg, the new owner. He had ridden a lot as a young man but now had too many other hobbies to afford a motorcycle (including working 7 days a week at his coffee shop). Warmed up, I continued south until I got to a crossroad with highway 214. I headed east on 214 and rode the loop past Silver Falls State Park which brought me back into Silverton. There was quite a bit of gravel on the road from recent freezes so I had to take it slow when riding through the park. I fueled up in Molalla on my way back home. Between the two rides my bike was filthy but happy sitting in my garage. Riding this time of year usually involves cold temperatures and precipitation, so my bike tends to have a dull well-ridden look. I also have my outdoor water faucets turned off to prevent freezing so washing the bike is not an easy option. In a product related note, I’ve been wearing a pair of Aerostich triple-digit glove covers during the colder rides lately. They work as advertised, keeping moisture away from my gloves underneath and adding warmth. A more accurate way to describe their function is they enable me to ride longer in the winter before my hands get cold — which they eventually do no matter what. It was a pretty good Labor Day weekend. The weather wasn’t too hot or cold, it was dry, and I had a nice mix of productivity, rest, and recreation. Of course, that means I got a good ride in. This time I headed up the Clackamas River road to Ripplebrook Ranger Station, where several government vehicles were parked at a forest fire staging area (presumably there was a fire nearby but I saw no smoke or flames). Instead of heading south to Detroit as I usually do, I headed east on FS57 past Harriett Lake and up the gravel road to Timothy Lake. The road up the back side emerges at the lake’s outlet, a man-made dike that flooded Timothy Meadows back in the 50’s or 60’s. The water shoots out in a dramatic spray below the dike and flows west to the Clackamas River. Once I crossed the dike I rode around the various campgrounds on the southern shore of the lake, then got onto Skyline Road for about a dozen miles before merging onto Highway 26. Once up and over Government Camp I stopped at the Dairy Queen on Rhododendron for lunch (avoid the mushroom swiss burgers; they’re nasty). Fed, I left 26 in Zigzag and headed about a mile up Lolo Pass Road where I then cut west again on Barlow Trail Road and followed my favorite “Marmot Run” into the back side of Sandy and home. My new Bridgestone Battle Wing tires were broken in and performed great, riding nice and smooth and providing plenty of grip. They’re supposed to grip really good on wet pavement. It’s supposed to rain most of this week so I may commute one or two days to test it out.